~ Hon. Peter Rubin, ACS founder and (since 2008) justice of the Massachusetts Appeals Court, in an address to the Columbia Law School ACS Student Chapter, January 19, 2006. From its founding, ACS has advocated for true equality of opportunity, the taproot of American democracy. Rejecting the formal equality yielded by more conservative readings of our Constitution and laws, instead we seek equity—an authentically fair chance for all. But equity evades easy solutions, and inequity is spread so broadly across so many dimensions it’s difficult to know where to start. The answer, as I’ve written previously in this space, may well lie in approaches informed by collective impact—a modern Archimedes’ lever. Consider the work of Nadine Burke Harris, M.D., MPH, FAAP, a pediatrician who started a clinic in the Bayview neighborhood of San Francisco following her residency at Stanford. On Thursday, July 2, Dr. Burke Harris visited Orrick, Herrington & Sutcliffe to address an audience filled with United Way of the Bay Area Women’s Leadership Council members, ACS Bay Area Lawyer Chapter members, and their guests. The Bayview is a neighborhood rich in family and community ties. But it is poor in resources and health, and suffers one of the the highest crime rates in the city. After Dr. Burke Harris opened the Bayview Child Health Center, she began to see the links links between early childhood adversity and health. She began to see children coming to the clinic with high rates of asthma, ADHD, and other childhood illnesses at many times the rate of the general population. “Doctora,” one of her patients explained, “it seems like my daughter’s asthma is worse when her daddy punches a hole in the wall.” That’s obviously terrifying for a child—but why would asthma follow? As Dr. Burke Harris recounts, the answer materialized when a colleague came to her with the 1998 Kaiser study called “Adverse Childhood Experiences,” or ACEs. This was the “aha” moment that would ultimately change the course of her career and lead to creation of the Center for Youth Wellness. ACEs are stressful and potentially traumatic experiences over which a child has no control. These experiences can have lifelong implications for health and future succcess. In 1998, a Centers for Disease Control (CDC) study conducted with Kaiser Permanente studied the childhood experiences of 17,000 KP patients (science nerds can find the peer-reviewed study here). Its purpose was to understand connections between childhood adversity and later health outcomes. It tested for seven specific events: psychological, physical, or sexual abuse; violence against the mother; living with household members who were substance abusers, mentally ill or suicidal, or ever imprisoned. The study, since replicated, yielded stunning results. ACEs are remarkably prevalent, they are universal, and persons with four or more face substantial lifetime risk of serious health problems and early mortality. Exposure to ACEs and toxic stress can compound across communities and generations. Dr. Burke Harris has found that “the principal actor in the link between ACEs and disease is . . . the body’s ‘fight-or-flight’ response.” That heart-pounding response that is evolutionarily useful when you have to fight a bear becomes toxic when activated over and over and over in the presence of violence or other trauma. ACE researchers now know that toxic stress alters gene expression. And they suspect that these changes may be heritable, meaning that the impact of stressful environments may compound and become more complex from generation to generation. For example, some researchers now believe that ADHD ― attention deficit hyperactivity disorder ― can be a function of stress and/or poverty. And ADHD, which affects one in nine American children, is a brain condition that researchers believe is heritable. Resilience and recovery from ACEs can be taught. Dr. Burke Harris emphasizes that the ACEs cycle can absolutely be broken. Six powerful resilience factors can be taught to any affected person: sleep; diet; exercise; mental health care; meditation; and nurturing personal relationships. Once children at risk of ACE exposure are identified through screening, the Center for Youth Wellness staff can work with the child and family to protect and strengthen. Read more about current research into toxic stress biomarkers and co-occurring ACEs here. Exposure to ACEs is a social justice and human rights issue. We know that the ACEs cycle can be broken. But consider for a moment the list of factors in building resilience. For parents in vulnerable, low-income communities, obtaining fresh, healthy food can be a real challenge, as I’ve noted here. Sleep can be difficult when parental work schedules are chaotic, as often happens in the service jobs prevalent in the Bayview. Exercise opportunities can be limited by the lack of facilities and by public safety issues. Health disparities are, after all, socioeconomic disparities. That’s where collective impact comes in. When several agencies and programs partner with the community and each other, durable gains are within reach. Dr. Burke Harris and her staff at the Center for Youth Wellness are working to improve the health outcomes for children and youth exposed to ACEs and toxic stress. But to do that, she needs a host of other partners to pull their own oars—community champions like Villy Wang of BAYCAT, a media arts business that trains and employs Bayview youth; Hunters Point Family, providing after-school learning and fitness for local kids; and City of Dreams, which mentors children living in low-income and public housing communities. The key is a joint focus on making the elements of resilience accessible to all—and, ultimately, on creating laws and policies that support and enhance the community’s capacity to provide them. The road to true equity of opportunity is long, and we aren’t nearly there yet. But Dr. Burke Harris and her partners have started drawing the map in the Bayview and are beginning to have an impact nationally. Stay tuned. Today, the American Constitution Society published a post I co-authored with Marion Standish of The California Endowment on Big Food’s fight against proposed voluntary regulations of advertising to children. I’m cross-posting it here. Also check out SodaSucks.org, The California Endowment’s anti-soda initiative formed to promote public comment on the proposed regulations. A coalition of Big Food-makers, fast-food chains, and media giants calling itself the Sensible Food Policy Coalition has joined an all-out battle against voluntary nutritional guidelines for foods marketed to children. Opponents are fighting for the right to continue advertising soda, fast food, sugared breakfast cereal, and a wide variety of other low-nutrition, high-calorie food products to the nation’s children without even voluntary restrictions. The yearly spend on direct marketing to kids? About $2 billion. The draconian (albeit voluntary) guidelines they’re battling against? Principle 1: encourage children to “choose foods that make a meaningful contribution to a healthful diet.” Principle 2: encourage children to “minimize consu mption of foods with significant amounts of nutrients that could have a negative impact on health or weight—specifically, sodium, saturated fat, trans fat, and added sugars.” Remember, the proposal doesn’t involve limitations on the food products themselves: these are marketing guidelines. The proposed guidelines are the work of an interagency working group formed by a bipartisan Congressional directive; the group includes the FTC, the Centers for Disease Control and Prevention, the FDA, and the USDA, and the guidelines are supported by the American Heart Association, the American Cancer Society, and others. Lining up in opposition is the Sensible Food Policy Coalition: Viacom, Time Warner, the U.S. Chamber of Commerce, PepsiCo, General Mills, Kellogg’s, the American Association of Ad Agencies, and others. Together, the Coalition has spent about $60 million on lobbying during the Obama administration. One side knows health; the other side knows the free market. Or does it? According to the Washington Post, “advertising agencies touted one economic analysis that suggested the government’s guidelines would kill 75,000 jobs annually,” and Rep. Jo Ann Emerson (R-Mo.) earnestly requested an economic impact analysis of the regulations before they are put into effect. Game on, Rep. Emerson. It could well be that these regulations would cost thousands of jobs, and that would have an economic impact for sure. But let’s look at the ultimate impact of all this marketing on the targeted public and the economy as a whole. Advertisers dangle Tony the Tiger, buckets of Pepsi, and bags of Doritos in front of young noses unable as of yet to sniff out and reject manipulative advertising. That $2 billion a year goes directly into creating demand for low-nutrition, high-calorie food products and soda. The massive sales that result mean money in the coffers of Big Food, surely, and more jobs too. And also more externalized cost. Because here’s the thing: as children consume more and become afflicted by overweight and obesity, health costs soar—and as children grow up, the wave of obesity rises too. It’s not just about health care, either; it’s also about productivity, and in children, it’s about the ability to concentrate and learn. Let’s look at what the unbridled marketing of sugar, salt, and fat has wrought on the next generation of Americans. One in three children is now overweight or obese, and the percentage is growing. According to the CDC, obesity among children aged 6 to 11 years increased from 6.5 percent in 1980 to 19.6 percent in 2008. The American Academy of Child & Adolescent Psychiatry notes that childhood obesity is extremely difficult to treat; and overweight children are much more likely to become overweight adults. 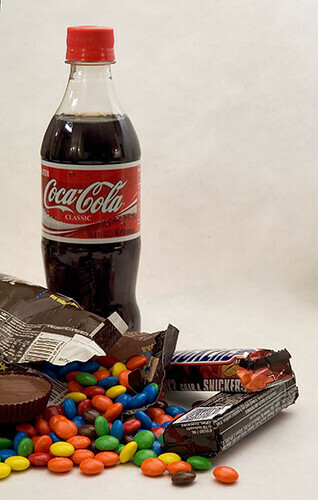 Children who watch more TV consume more of the high-calorie, low-nutrient foods they see advertised; the link to physical inactivity is not as strong as the link to junk-food marketing. Randomized trials have demonstrated the link between TV exposure, food advertising, food choices, and intake levels. The increasing prevalence of sugar-sweetened beverages is strongly linked to the rise in American obesity. Soft drinks “contribute more energy to the diet than any other single type of food or beverage,” and they are some of the cheapest energy sources available. Increasing portion sizes, decreasing prices, and increased marketing have very likely contributed to increased consumption of these beverages. Make no mistake. Whatever the big-food marketers may claim, this is about pushing unhealthy food on children who lack the cognitive skills to discern manipulative advertising or identify foods and drinks that stand a good chance of making them sick. The battle for regulation of junk food marketing to children is one we must fight, again and again, in the years to come. And we cannot afford to lose. One estimate pegs thenational cost of childhood obesity at approximately $11 billion for children with private insurance and $3 billion for those with Medicaid; obese children are two to three times more likely to be hospitalized. The CDC estimates the overall direct and indirect cost of obesity at approximately $147 billion in 2008 dollars. And remember—obesity rates are rising, and quickly. Obesity rates rosein 16 states in the past year. They did not decrease in any. Let’s return for a moment to that economic impact analysis that Rep. Emerson requested. The voluntary regulations may cause job loss if (1) companies follow them (because the government would not have any enforcement power), and if (2) following them significantly decreases children’s demand for the products. That job loss, where workers are unable to shift to another sector, could cause economic loss to an unspecified degree. But what happens if Big Food starts pushing healthy food products? Sales decreases and job losses are simply not necessary consequences of regulation. If we make no changes to marketing, and the childhood obesity rate continues to increase, we are looking at costs associated with childhood obesity that stand at $3 billion and rising for Medicaid child patients alone, and $14 billion for all children. And the big-food industry completely externalizes these costs: the bills are paid either directly or indirectly by the public—not by the profiting junk food purveyors. Those costs do not stem entirely from marketing, of course, but consider the recent steep rise in childhood obesity and concomitant rise in exposure to food advertising. The link is there. If the voluntary regulations work as well as the Coalition claims they will, children will consume less low-nutrient, high-calorie food. Even small changes here add up to big advantages, especially in obesity prevention. And that translates to dollars coming off our common health care bill. The FTC is taking public comment on the proposed voluntary regulations right now. Please use this form to have your say by the July 14 deadline. The California Endowment has also posted commentary and suggestions on this issue.